A very effective, ready to use intensive spot spray application for use where lameness is more evident. Contains very concentrated anti-bacterial, anti-fungal and anti-viral ingredients. Barrierï¿½s foot products for Sheep are radically different. They contain powerful and very concentrated anti-bacterial, anti-fungal and anti-viral ingredients. Easy and pleasant to use, causing absolutely no pain to the animal or user. These products are designed for use in intensive farming where saving time and money is of the utmost importance. However, the formulations are also suitable for use in organic farming systems, as they fall into the exempt category of products which use only plant oils as active ingredients, as listed in Annexe IIB (Pesticides) of Council Regulation (EEC) No 2092/91 (as amended). Organic Matter: The effectiveness of our hoof & foot products is not affected by organic matter. Spray directly between claws to raw, broken painful areas, and repeat as necessary. They contain concentrated plant derivatives and are entirely non-toxic, and non-corrosive, even in concentrated form. Each ingredient is registered with the department of Novel Foods and Flavours at the Ministry of Agriculture, Fisheries and Foods. Neither the Council of Europeï¿½s Committee of Experts on Flavouring Substances nor any other European Committee has recommended limits on the use of these ingredients. The US Flavouring Extract Manufacturersï¿½ Association (FEMA) who has classified them as FRAS (Generally Recognised As Safe) in l965 has evaluated these ingredients. These assessments were published in a paper Hall R.L. and Osier B.L. (l965). Not only have Barriers products improved and maintained the health of my stock, but also, they have been a real benefit to the farming industry. 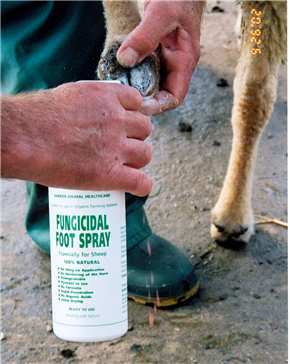 The fungicidal Foot & Hoof Baths are safe to use and are very effective. Below are some recent questions we've received regarding Barrier Fungicidal Foot Spray - For Sheep, including answers from our team. Is this product sold in South Africa? Thanks for your question. We are not sure if this product is sold in South Africa, but when it comes back in stock with us you can add it to your basket to check if our courier partners can deliver to your particular address.